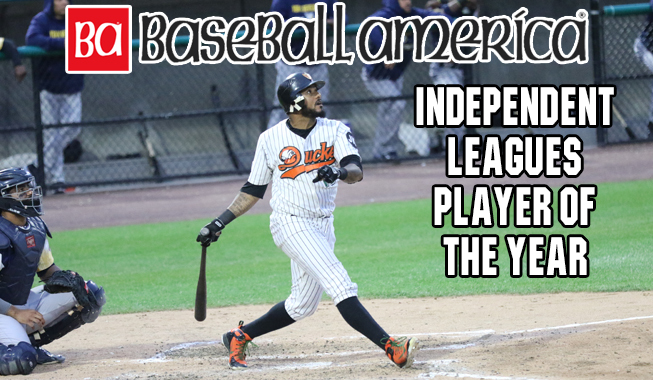 (Central Islip, N.Y., Nov. 23, 2018) – Baseball America, known industry-wide as “The Bible of Baseball”, has selected Ducks infielder Jordany Valdespin as the 2018 “Independent Leagues Player of the Year” in its annual end-of-season awards edition, on newsstands December 7. Valdespin becomes the first Duck and fifth Atlantic League player honored with the award in its 23-year history. Valdespin, who was also named the Atlantic League’s Player of the Year, led the league with 154 hits, 94 runs scored and seven doubles during the 2018 season while ranking second in batting average at .3377, just .0007 from the batting title. The four-year MLB veteran was also among the league’s Top 5 in several other categories, finishing second in on-base percentage (.399) and total bases (222), third in stolen base percentage (.857) and fifth in slugging percentage (.487). In 113 regular season games, he totaled 12 home runs, 55 RBIs, 18 doubles and 46 walks. Additionally, the Dominican Republic native posted the longest on-base streak in the league this past season at 32 consecutive games from June 4th to July 14th. He was selected to play in the Atlantic League All-Star Game, held at Long Island’s Bethpage Ballpark on July 11th, and went 1-for-3 with a walk and a stolen base in the game. The 30-year-old was also named the league’s Co-Player of the Month for April/May after leading the league in hits (45), runs (29), total bases (73), extra-base hits (17), and at bats (131) in that span. He was voted by fans as the Delmonte-Smelson Team MVP in September and was chosen as the Atlantic League’s Post-Season All-Star second baseman in October. Valdespin became the third player in franchise history to be named the Atlantic League’s Player of the Year. Lew Ford most recently claimed the award in 2014 after breaking the league record for hits in a single season with 189 while becoming the first player in league history to play in all 140 games during the regular season. Ray Navarrete was the first Duck to garner Player of the Year honors after he led the league in RBIs (96), hits (164), runs (106), extra-base hits (66) and doubles (39) during the 2009 season.